You know the days when it takes every bit of energy you have to get out of bed? The days when all you feel like doing is brooding around the house in your pajamas? The days when your heart hurts, your smile has secured itself under lock and key, and the only words you can manage to mumble out are rotten and spiteful? Days like that require two things. 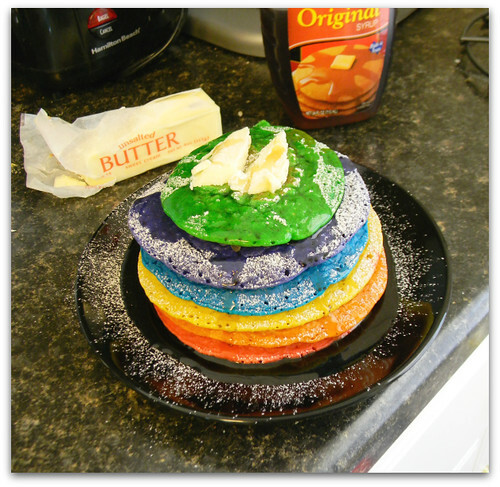 A hug, and rainbow pancakes. I made these for Husby about two weeks ago as a surprise to cheer him up. 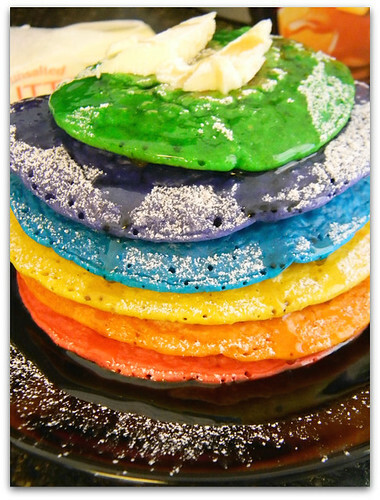 Because hey, rainbow pancakes = sunshine and blue sky’s on a plate. I used this recipe i found on Tasty Kitchen, except that i left out the oil and the sugar and just added milk as needed. Plus cinnamon. Can’t have pancakes without cinnamon. I also cut the ingredients into smaller portions since i was only cooking them for one. 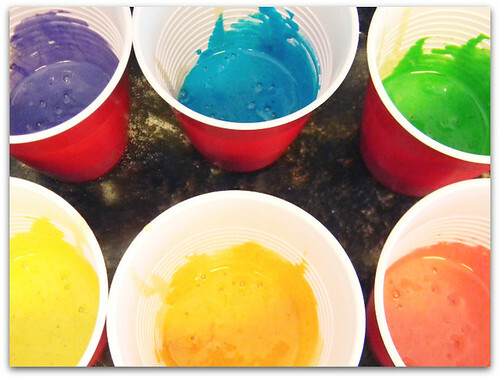 Really, all you need to do is whip up your fave pancake batter and separate it into as many cups or bowls as the amount of colors you will be using. 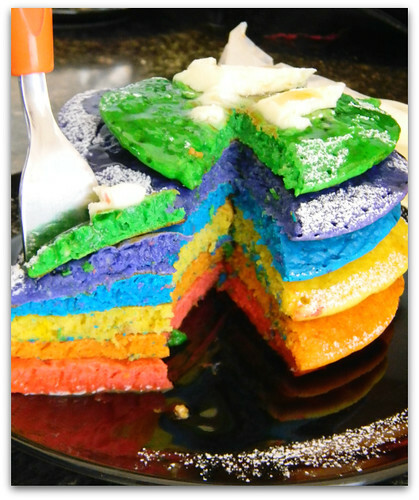 I used gel food coloring from Wilton because they work great in baked goods and you only need to use a wee bit. Do you know one of the secrets to good pancakes? Its all in the air bubbles. For reals. Don’t flip that pancake until it looks like its full of teeny little holes. Confession; pancakes aren’t my favorite. They taste good and all, but i’d rather have a waffle. I think its a texture thing. Husby however prefers pancakes all the way. What’s your favorite breakfast comfort food? Posted in Tasty TuesdaysTagged cooking, foods, pics, tasty tuesdaysBookmark the permalink.